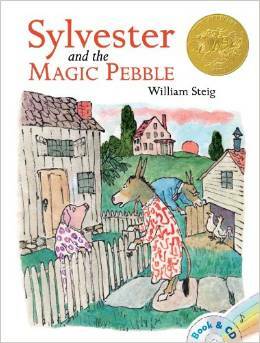 One of first books I bought for my children was Sylvester and the Magic Pebble. I remember being fascinated by the story, not the drawings, when I was a child. The Caldecott winning book is about Sylvester Duncan, a donkey who collects pebbles “of unusual shape and color.” He is holding the pebble when he encounters a lion and wishes he were a rock. When he turns into one, the pebble falls off so he doesn’t have the ability to make another wish. Despite his parents frantic search, no one can find him as long as he remains a rock. After a year, circumstances allow Sylvester to reunite with his parents. But the message is clear: wishes aren’t all they are cracked up to be. The most important lesson in life is to appreciate all that we already have. That lesson always makes me smile. Posted on June 17, 2014, in My life, perspective and tagged 365 reasons to smile, books, children's books, lessons, life, musings, smiles, summer, Sylvester and the Magic Pebble, Thoughts. Bookmark the permalink. Leave a comment.